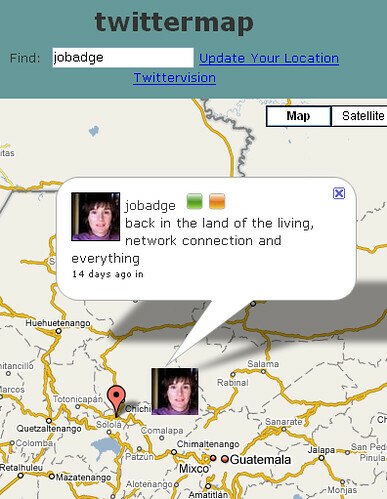 Just checking out some of the links from Alan’s blog post on evaluating our small world networks, and twittermap told me I had moved to Guatemala. Can’t think that Guatemala and Leicester are all that similar, but perhaps global warming is having more of an effect than I thought! Twitterlocal did a good job of finding my colleagues in Leicester, so perhaps this is a better bet! I have been trying to convince my better half that I am not just frittering my time away using twitter but doing something useful. He doesn’t seem to believe that anyone of any real intelligence would use such a medium. 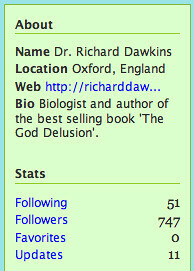 Salvation came when last night (via my twitter network of course) I discovered that Richard Dawkins joined twitter. Over the last 48 hours, the growth in the people following him has been amazing. The two shots below were taken just over 24 hours apart. I will wait and see what his reaction to twitter is, he certainly isn’t having a conversation just yet, but it is early days…. 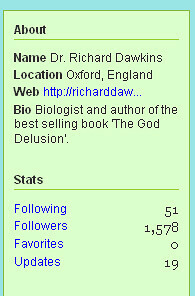 update: following a busy weekend, the followers have gone through the roof and I am pleased to report that Dawkins does appear to conversing in good trivial twitter style, and some more serious stuff too. About a month ago, I bought a white 4GB 700 eeePC. I wanted something to use while away from the office with conference season upon us, I didn’t want to wait for apple to announce nothing much at WWDC. Good job I didn’t wait, as I would have been disappointed (that is not to say that the iPhone PAYG is not looking very attractive to me – will have to see what the pricing is like). So far, I’ve really liked using it. It is small, cute, easy to use and the keyboard, although small, is a better solution for longer sessions of note taking than a PDA or iTouch would have been. My main grips so far are, of course, battery life, and that the little thing has trouble with our WPA connection to the BT home hub at home. Sometimes it works, sometimes it just won’t connect. I’d also like to be able to post straight to seesmic but that doesn’t seem to work. Next task is getting to grips with the real desktop, and enabling full desktop mode. I have finally realised that I need somewhere to put all the stuff I am accumulating online and in my head. 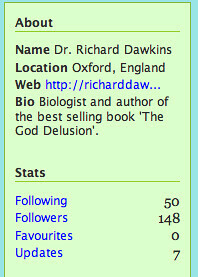 In order to preach web 2.0, I need to do it. While I started a blog to provide support to the School of Biological Sciences, I have noticed that there are more things I would like to record my thoughts about online, but they don’t necessarily fit in to that support role. I am hoping that this will fill the gap and that I can keep up regular posting! We’ll see.